With the ending of support for Windows XP and the shrinking number of vendors that can provide you with the very best DNC system, SFA can provide you a competitive upgrade and save you 25% off the list price—leveraging the same procedures and giving you more value. Programs are in place to migrate from Surban DNC, Refresh Your Memory, Cimnet, Greco Systems and other companies that no longer support existing systems. Contact Sales for more information. Check out our video series, “Automation Insights,” featuring information on “RS232 Cabling Solutions.” Our Newsroom webpage has also been updated with press releases and publications in trade magazine to help customers automate the shop floor. Don’t wait until it happens to you—the computer hard drive crashes, the RS232 cable fails, the serial hardware that links all your critical machines to your network could be the point of failure that stops production. Contact us today to get a backup, portable USB device that can work with any CNC machine. We hosted our first webinar on DataXchange on April 3 and the feedback was outstanding. Viewers were able to get a good glimpse of the product and asked questions about the free trial to run on their machines. Ask us about future webinars. 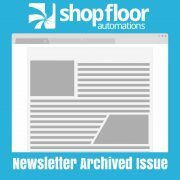 Q: What is your position at Shop Floor Automations? A: I am a Sr. Account Executive. I work with customers to determine their needs and help guide them to the products we offer that will be the best fit for them. I help them before, during and after the sale. What I like best about my job are the relationships I build with customers. Q: How long have you been with SFA? A: I’m coming up on my 13th year working for SFA, though it seems like it’s only been a few. Time sure flies. Q: What are your favorite products and why? A: My favorite product right now is probably the powerful JobPack Scheduler. It amazes me how many companies don’t have a true scheduling system; most just use whiteboards or an Excel spreadsheet, which is not very dynamic at all. I feel very strongly that JobPack is a great product that would benefit all my customers. A: I like to go RV camping and 4wheeling and I love to cook. Q: Tell us something we probably don’t know about you. A: For fun, I’ve been taking professional “chef” classes at the local community college and I’m working toward a line cook certification. I don’t plan on changing careers, but it’s fun to learn some industry tricks, and it gives me a better appreciation for all the work that goes into running a kitchen in a restaurant.